Our Ph.D. program received a very favorable evaluation in the latest report on U.S. graduate programs in mathematics from the National Research Council. Our presence in the top tier of departments is a testament to the vibrant research and teaching community that is thriving at Vanderbilt University. There are about 50 full-time faculty and just 40 graduate students in our department, providing an excellent student to faculty ratio. Our faculty includes one Fields Medalist and other world-renowned researchers, leading first-rate research groups in non-commutative geometry and operator algebras, approximation theory, algebra and topology, mathematical biology, graph theory and combinatorics, and others. 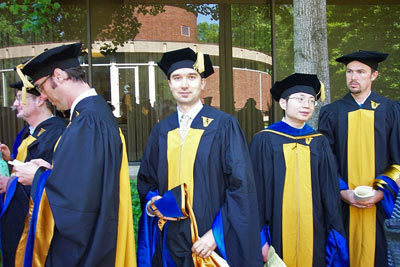 Beyond the mathematics department, Vanderbilt University has a wide range of research programs providing the opportunity to get to know, and collaborate with, students and faculty in other departments. We invite you to learn more by exploring this Graduate section of our website.